Pine cones appear everywhere and are easy to gather in the fall or winter. As free and natural materials for craft projects, they come in different sizes and have lots of uses when decorating the home. 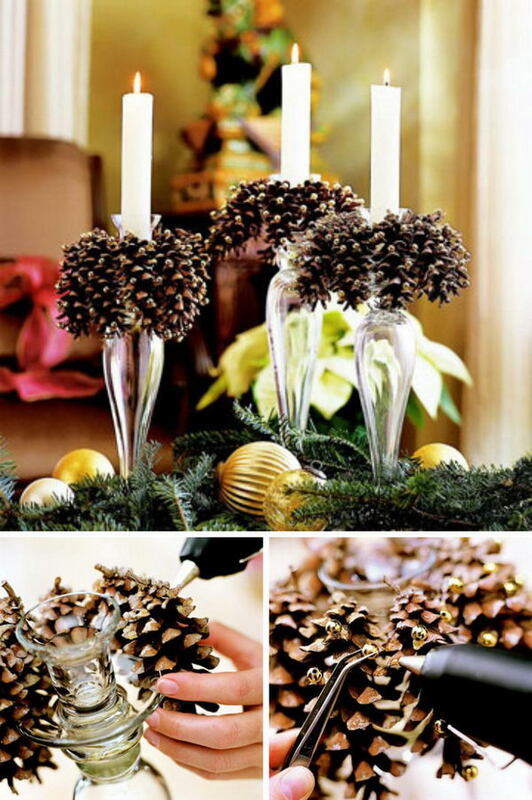 You can paint the pine cones with festive colors and use them for centerpieces to easily get the cheerful look and attract others’ eyes. 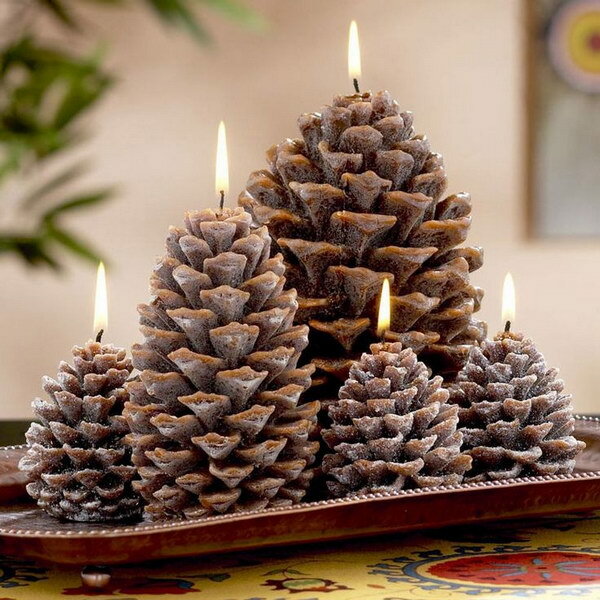 A tree made from pine cones is easy to make and festive during the holiday season. 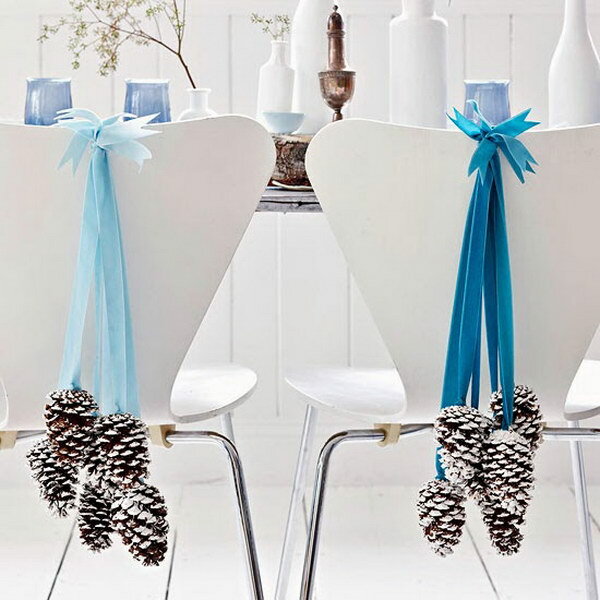 Check out these creative pine cone decorating ideas, which are perfect additions to any festive home. 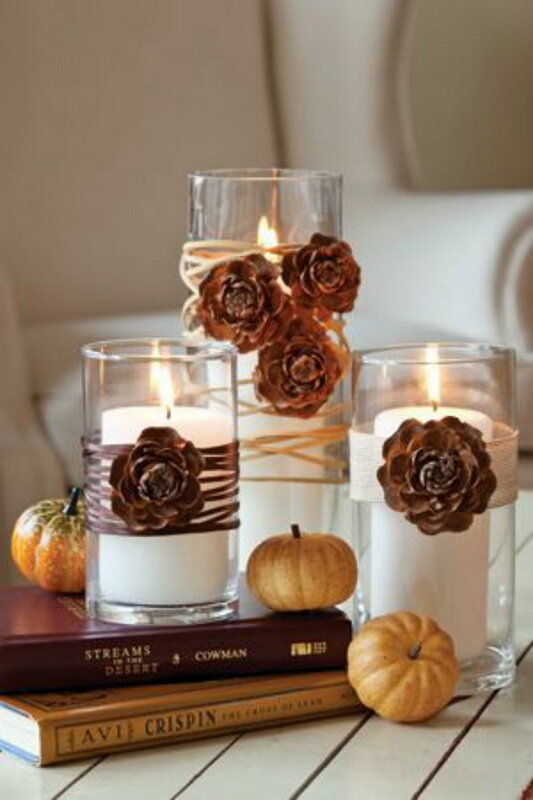 They are meant to add fun to your holiday decoration and make your house more charming! 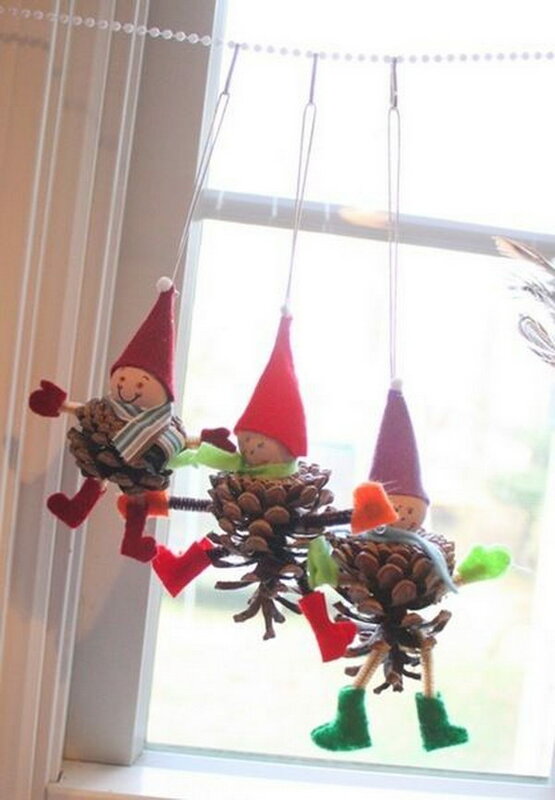 Follow the step by step tutorial on how to make cute elves for Christmas decorating via memoriesoncloverlane. 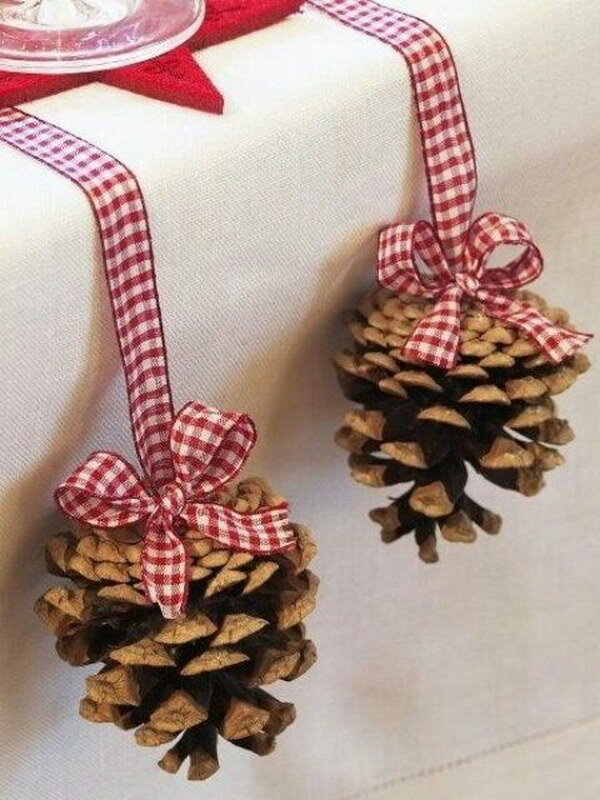 Screw picture hanging hooks into the top of pinecones and add ribbon. 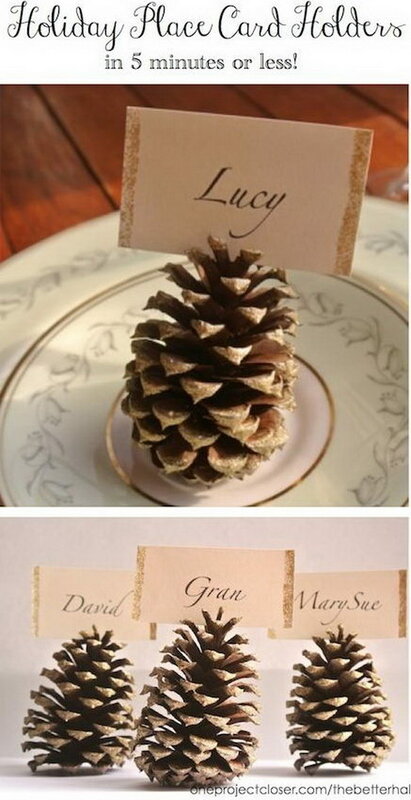 This is a beautiful way to add rustic to your Christmas table! Via deborabonetto. 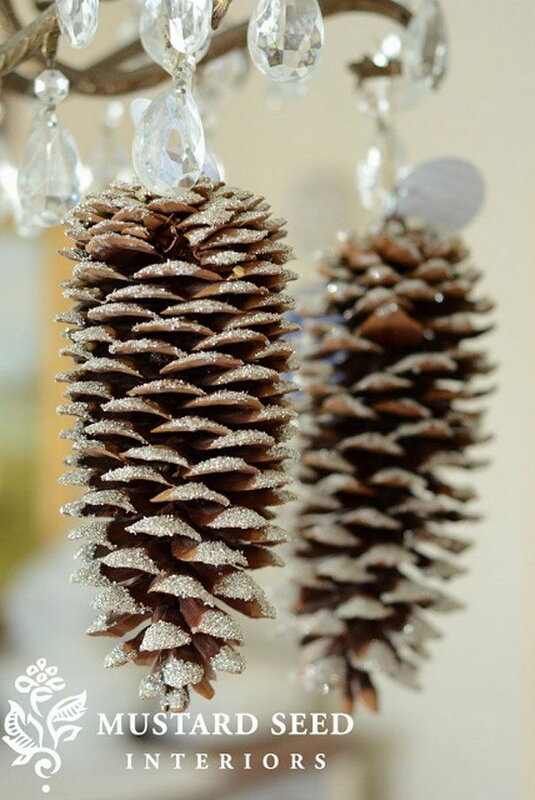 To get the chic look, you need pinecones in various sizes, spray paint mod podge, and glitter. Check out the tutorial on how to make your own via thegirlcreative. 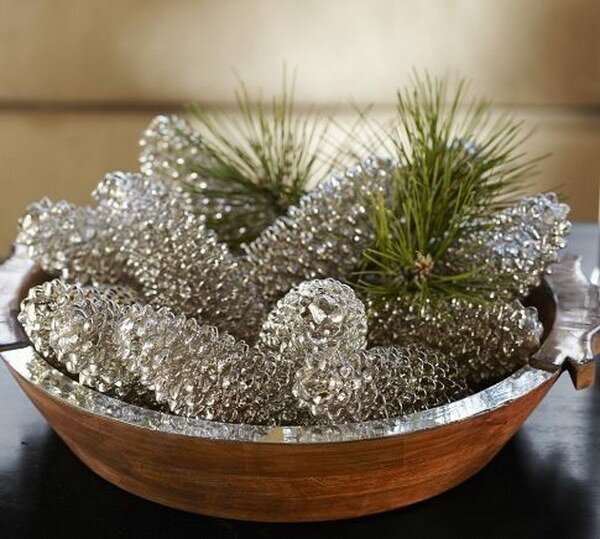 The frosted look pinecone ball is a quick and inexpensive craft project. Check out the easy to follow tutorial via source. Pinecones are great for home decor. 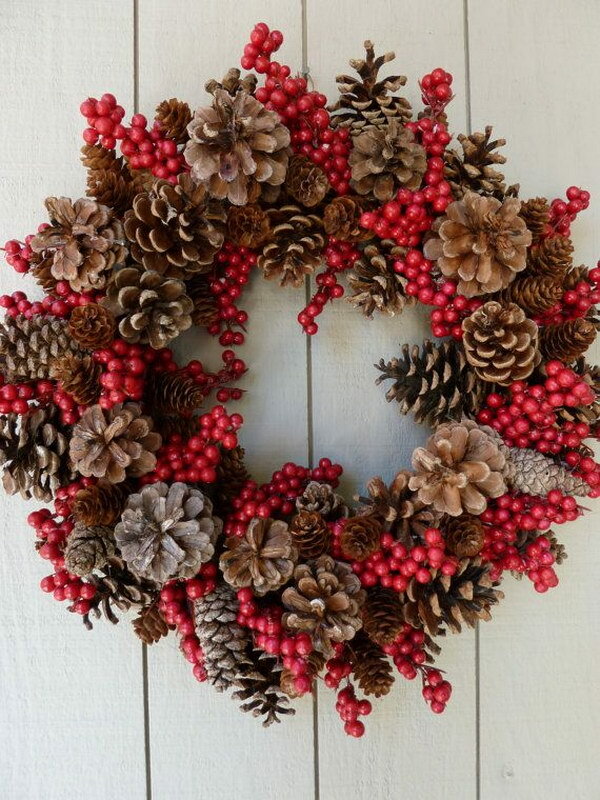 And a fresh coat of color enhances the subtle charm of pinecones. 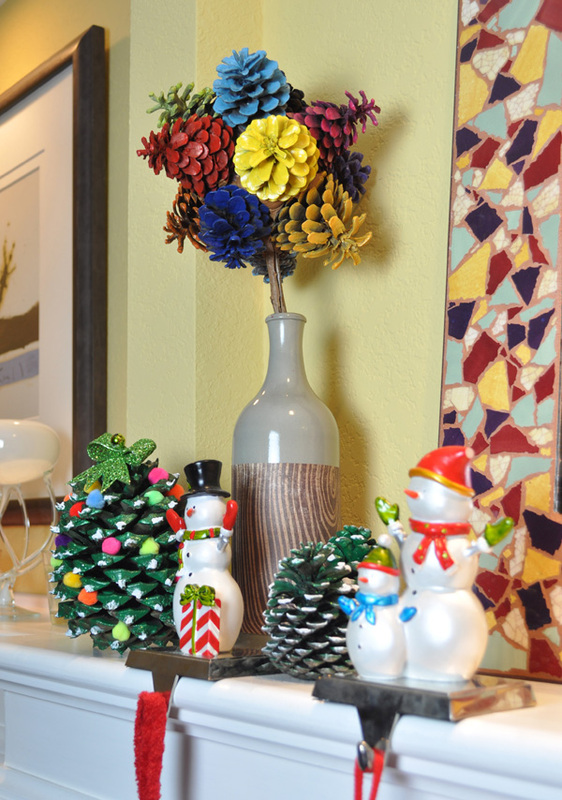 You can paint your pinecones any color you like and plus some pop to your room like these pinecone flowers and Christmas trees. Get the tutorial via chicacircle. I love the color scheme of this natural wreath. It looks so elegant and festive! Viadigsdigs. 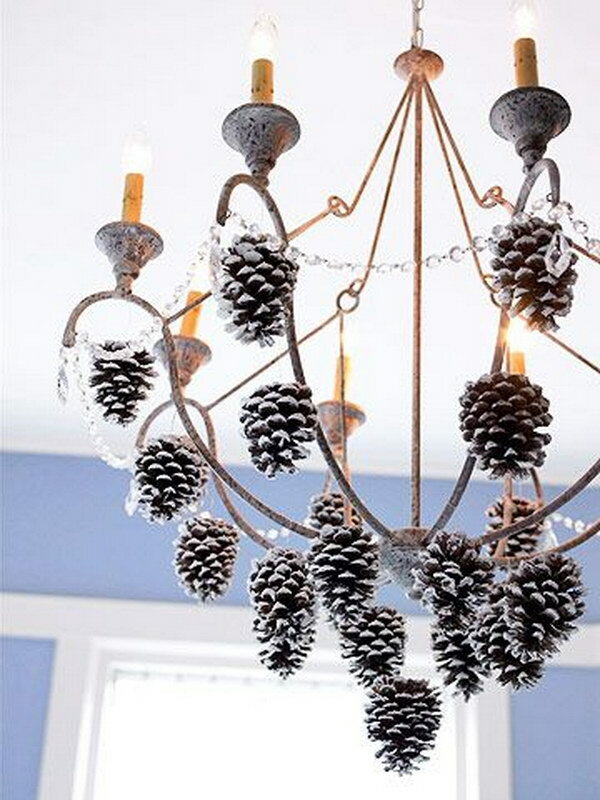 Use Krylon Looking Glass spray paint on pine cones to give that mercury glass look. This link really doesn’t tell you how to do this, but it’s pretty self explanatory. Via decorating-by-day. 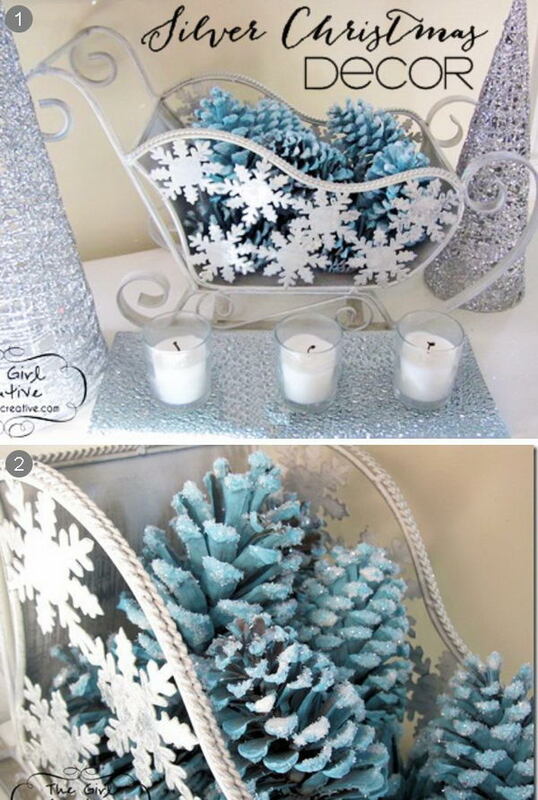 This is a quick and inexpensive winter project for your home. 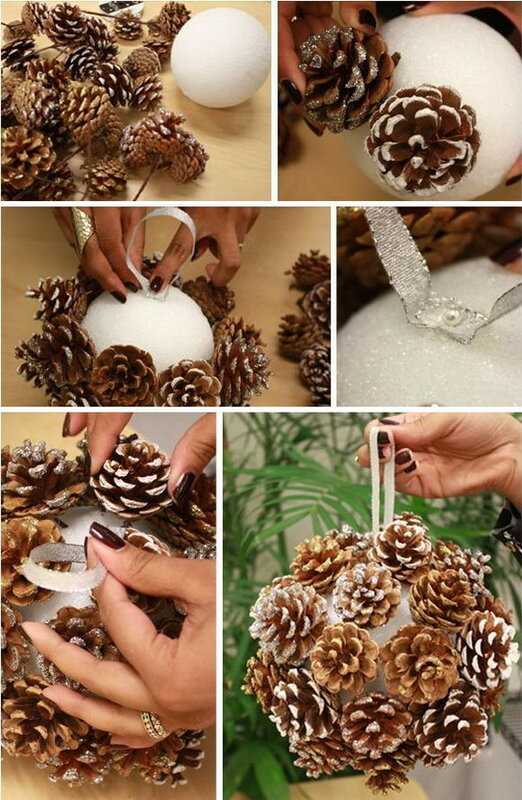 What you need are some snowflake ornaments from the dollar store, pinecones, ribbons, spray paint and glitter. Get the tutorial via mayarts. 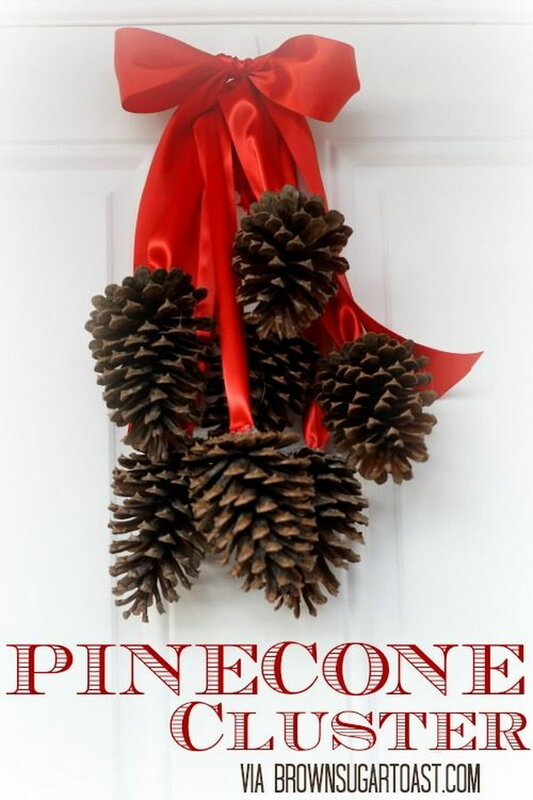 A pinecone Christmas tree are beautiful and easy to make. Learn how to get the snowy look! Tutorial via lifeonlakeshoredrive. 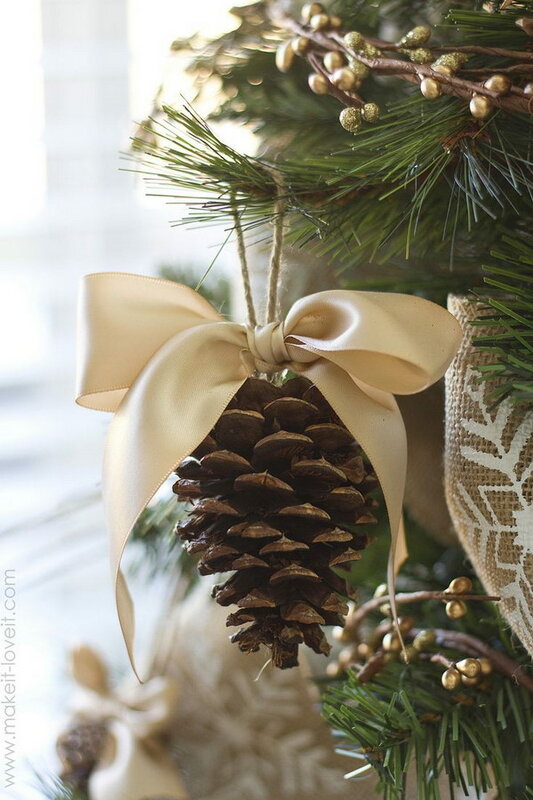 Have fun making ornaments for the Christmas tree with this simple idea that uses rustic pine cones and elegant satin ribbon. Via makeit-loveit. These natural beautiful Christmas candles are the perfect DIY project to do for the warm and sweet winter nights. Get the tutorial via thegreenhead. 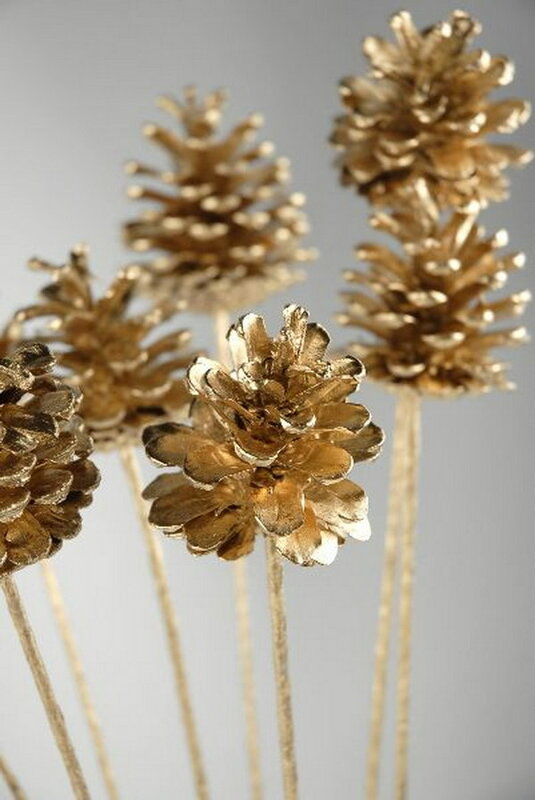 Come on by for the tour of how to make golden pinecones for a gold Christmas decorating. Via marthastewart. 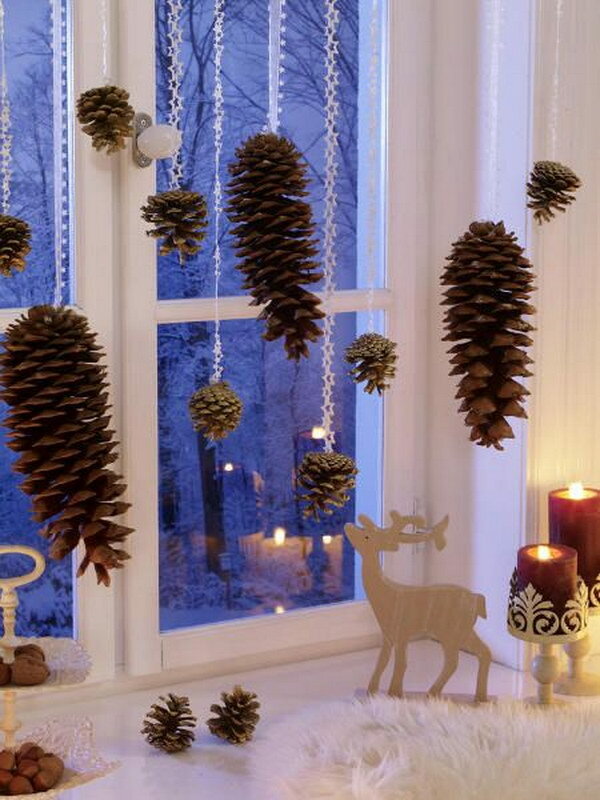 Love this idea with the branches lights and pinecones. Would be a great decoration on your tables for a large event during the holidays. Get the tutorial via trendytree. 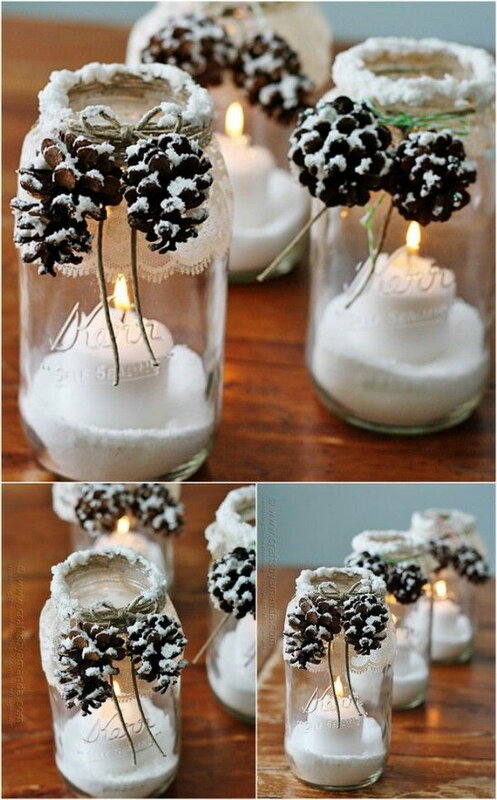 Great way to use natural “found” objects to warm up your spaces this winter. Get the tutorial via restorationhouseblog. 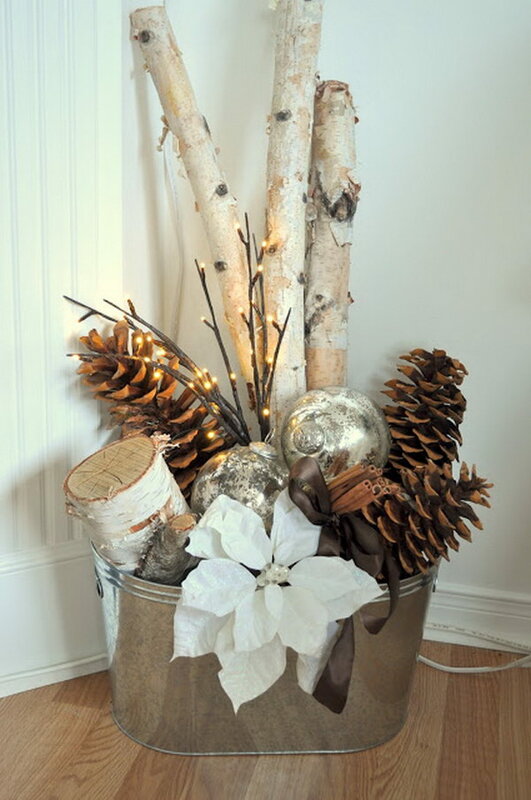 Use a pail full of birch branches, pine cones, clear lights, white and silver ornaments to make a great centerpiece for your Christmas table. Via apartmenttherapy. 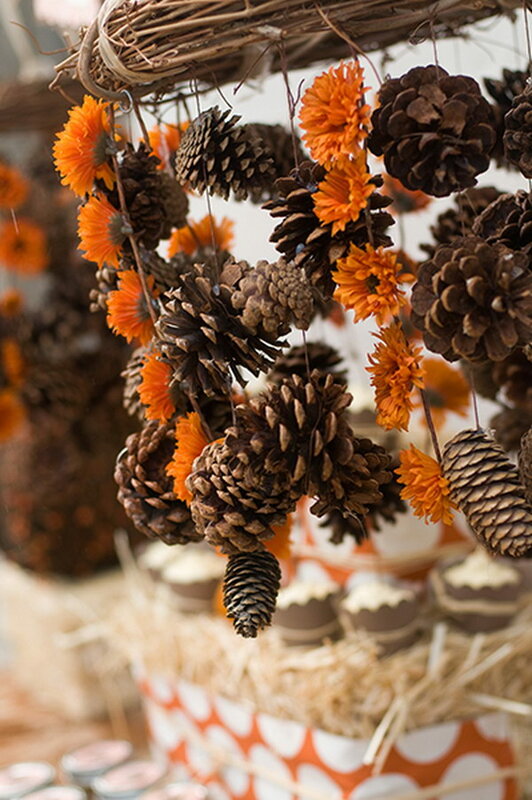 The pine cones and ornaments together make for a very festive table with simple ornaments and pinecones from the yard. 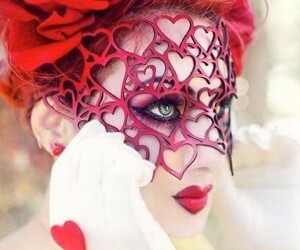 Via bonbonrosegirls. 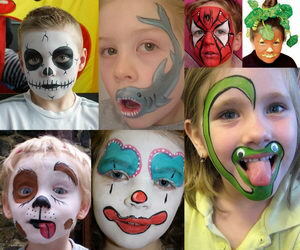 Check out this five minutes decoration project. 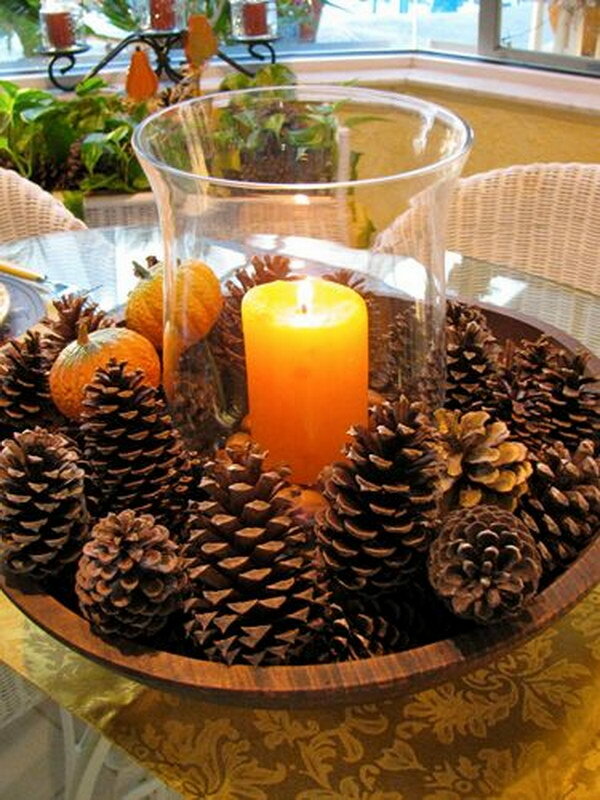 Just place pine cones in a large bowl and place a hurricane vase holding a candle in the middle. Get the tutorial via ritamay-days. Get the tutorial via dollarstorecrafts. 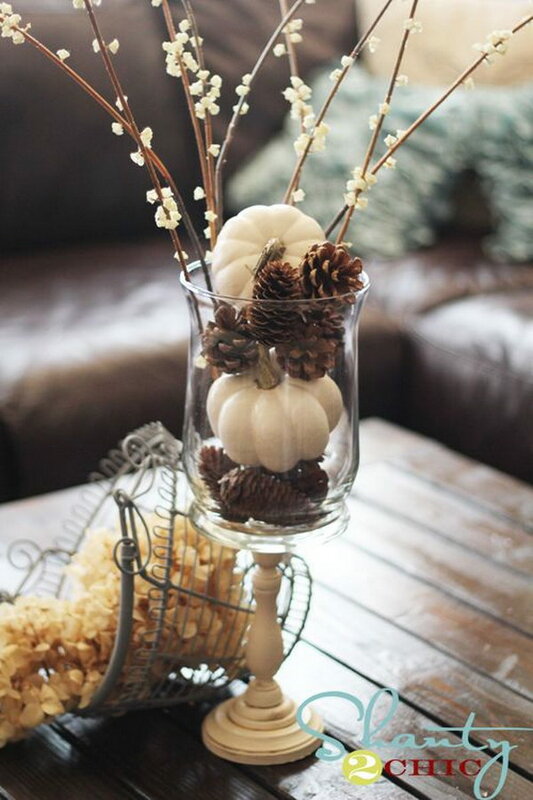 Use your pinecones and spray painted pumpkins to fill the vase and create a beautiful centerpiece. 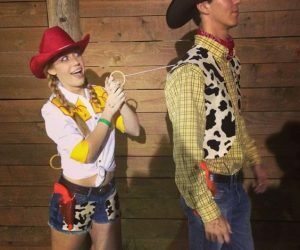 Get the tutorial via shanty-2-chic. 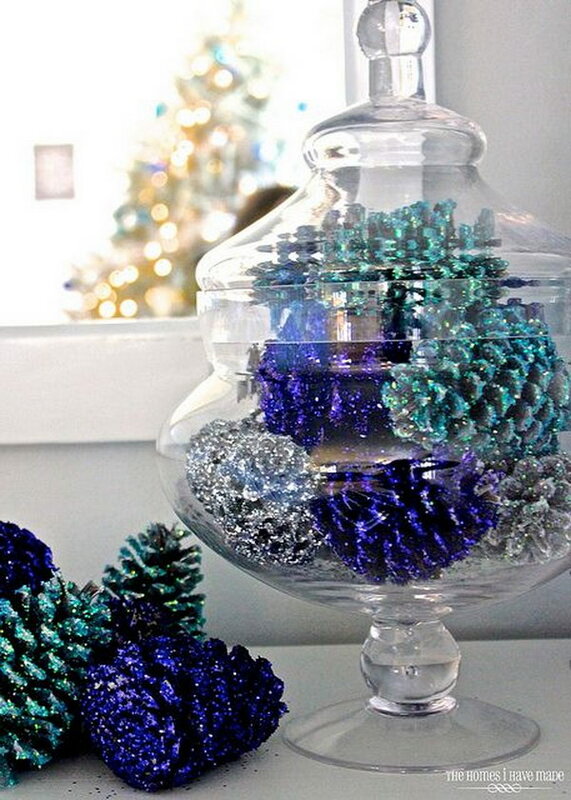 Decorate your home for the holiday by making these glittery blue pinecones. Tutorial via thehomesihavemade. Take a variety of glass cylinders, place candles inside, and wrap them with ribbon, twine, pinecone flowers and leather to make a beautiful inexpensive display. source. Rustic and elegant napkins rings for Thanksgiving. Get the tutorial via stonegableblog. So simple, yet creative! If you made them the cinnamon ones, it would make the room smell like Christmas! Get the tutorial via oneprojectcloser. How beautiful! I’m in love with the cute touch to the door! 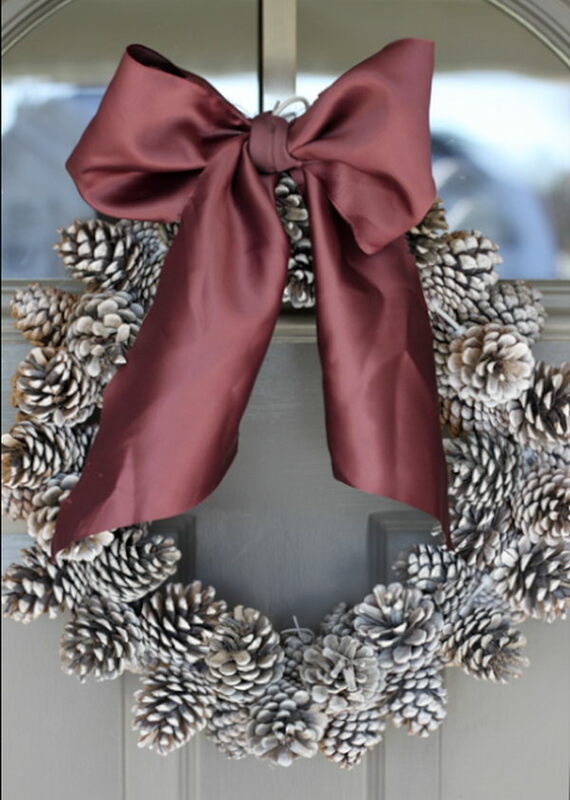 Gather pinecones in your yard and add a chunky ribbon. Get the tutorial via brownsugartoast. 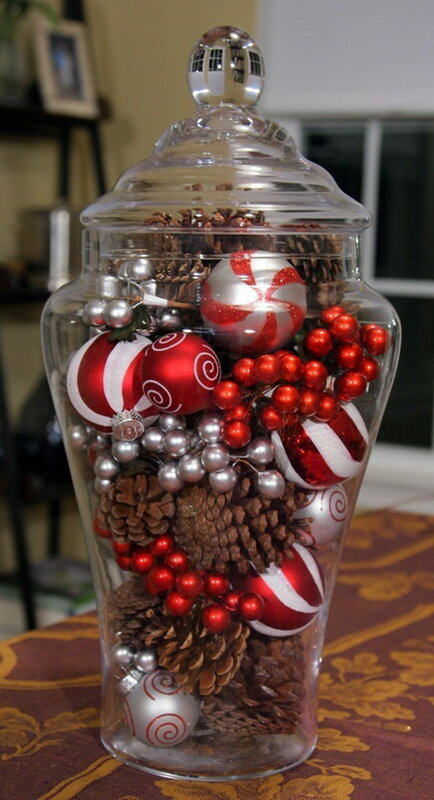 Simple and inexpensive to add fun to your holiday decoration. 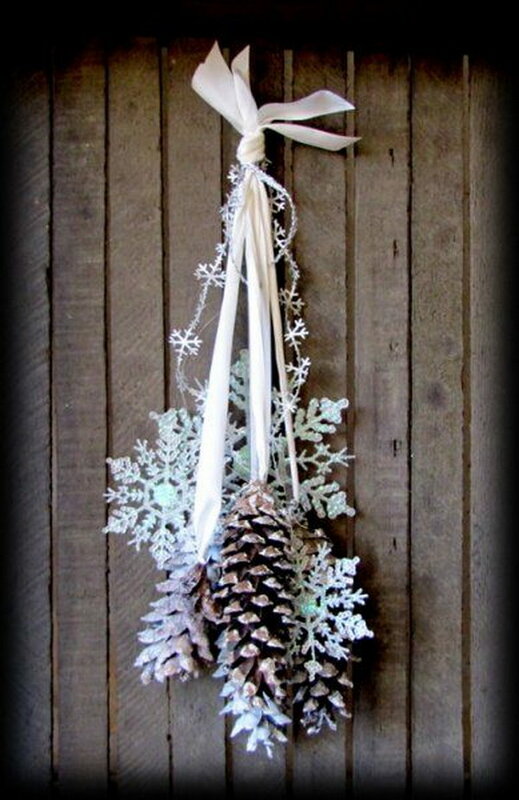 All you need are pine cones, paint and twine. Get the tutorial via ukcraftblog. All the decorative details add a elegant look and instant charm to any room. Via cozylittlehouse. 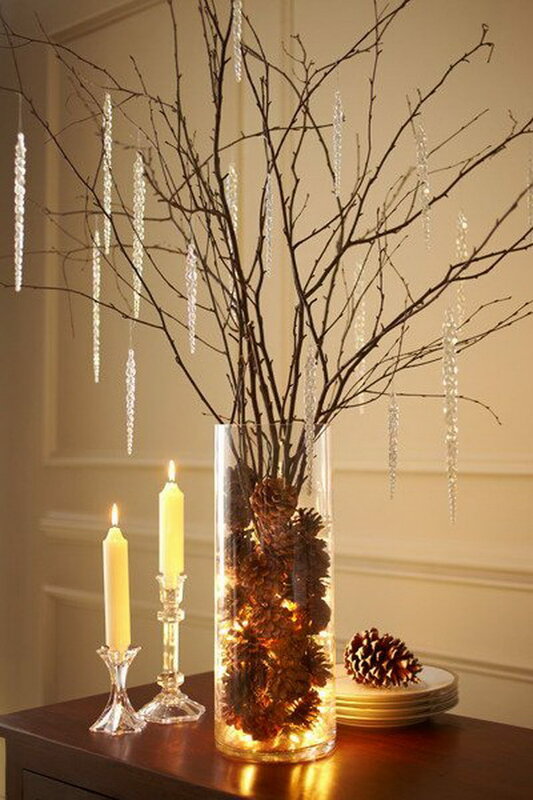 Looking for some classy but natural holiday decor? 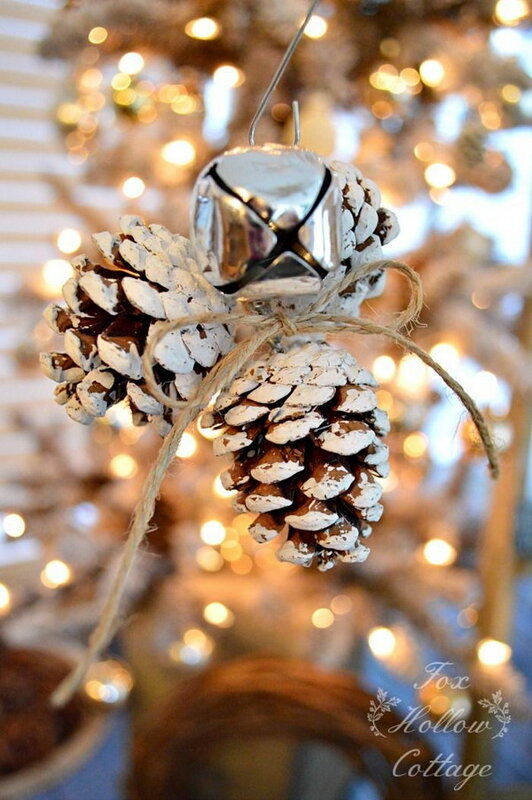 Try this jingle bell pinecone ornament! Get the tutorial via bystephanielynn. 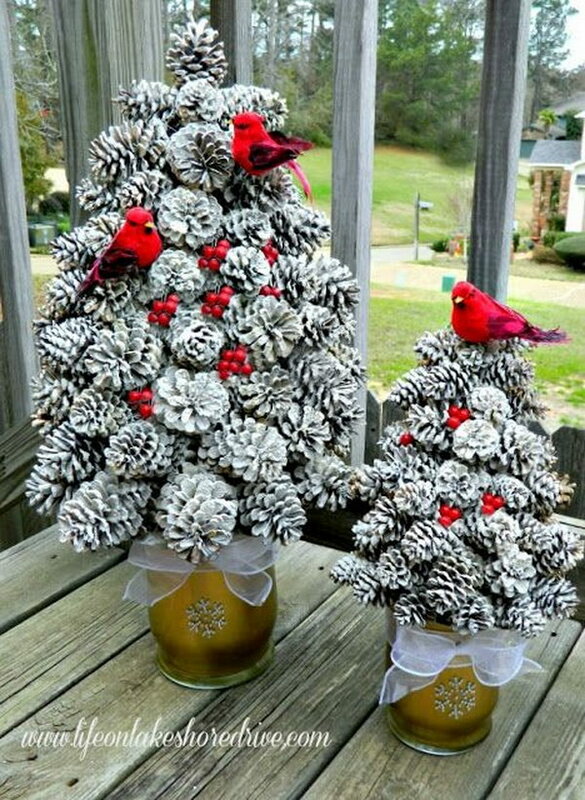 You can spray paint the backyard pinecones red. 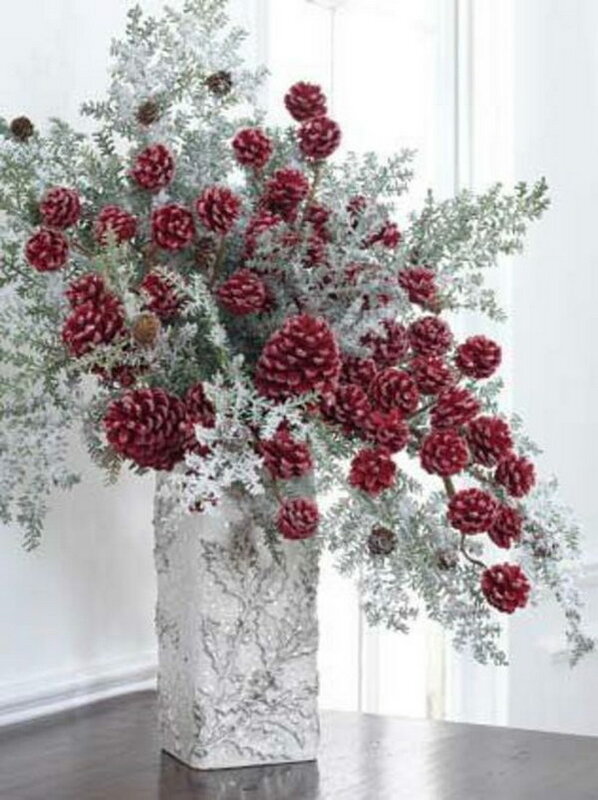 Then use them and snowy cedar branches to create a great contrast in this winter arrangement. Via razchristmas. 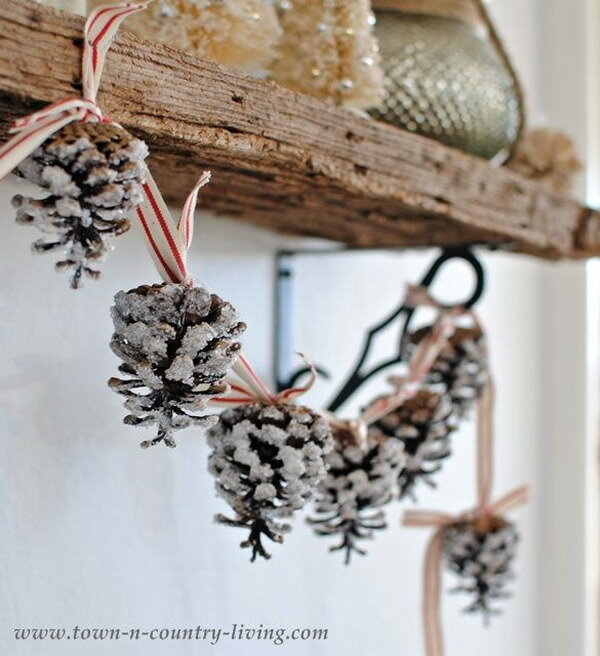 thanks so much for sharing my pinecone garland! Love this site. Lots of good ideas. Love love love it . 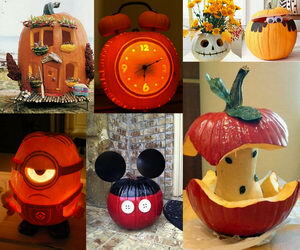 So creative . I love the pine comb,s creation.